There is something freeing about the idea of a motorcycle with a fuel capacity larger than most cars. With a huge 43 liter front tank, a 17 liter rear tank, and a pair of side tanks, assuming you packed enough survival gear, you could ride this damn thing across any large stretch of uninhabited land for basically as long as you like. Forget range anxiety, get lost in the desert for a week or more for the hell of it. And I desperately want to. The big Honda XRV650 Africa Twin RD03 bike features a 650cc V-twin with three valves per cylinder. It’ll rev out to an 8,800 rpm redline, and it makes a useful 57 horsepower. This bike, built in 1988, is slightly younger than I am, and has covered only about 49,000 miles in all that time. It’s unlikely I have the fortitude or conditioning to do so, but I would mount a serious effort to double its mileage reading in a year. Mostly off road, I would think. Overlanding is still a popular thing to do in the truck/suv world, and those nutters bring a whole house worth of stuff with them. All you really need is this race replica bike, some good suspension, a chuckwagon load of fuel, and a knapsack full of Clif bars. Oh, and depending on where you’re going in the U.S. snake and/or bear repellent. 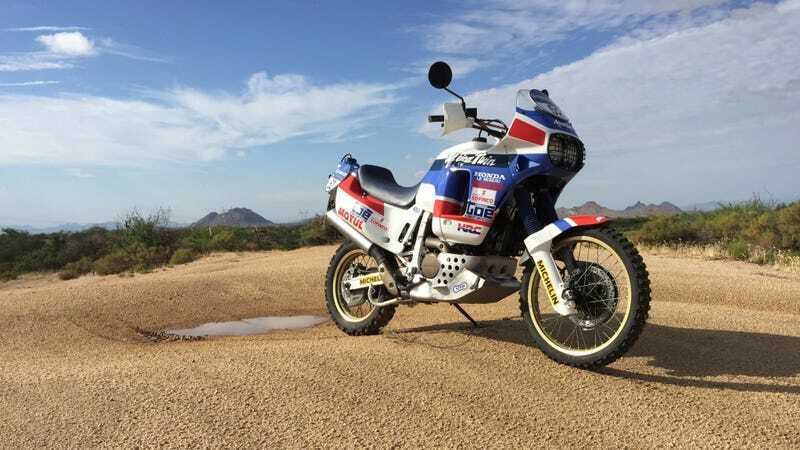 This particular bike is a convincing replica of the same fifty similar units Honda sent to tackle the 1990 Paris-Dakar Marathon. This bike doesn’t have the race-ready version’s wider rear wheel and tire package, but it’s a pretty convincing dupe. I love it, and I would lay down my life to defend it. This bike is my new best friend. Sadly, with 11 cars and 3 motorcycles, I need to not buy anything more until I can sell a few things. Someone else save it for me and ride it off into the sunset. Someone, or a few someones, spent a lot of money getting this bike into this kind of shape. This was definitely a passion project, as nobody will ever offer more than $10,000 for such a build. I hope they get top dollar, because it appears very well made. Go get your bid in on Bring A Trailer right now if you want to ride a V-twin powered iron horse into the middle of nowhere and back.